Based in Montréal, Canada, since 2007, 123KLAN is a graffiti crew founded by the French duo Scien and Mrs Klor in 1992. Tireless, effervescent and often ironic creative force, Scien and Klor have been doing their art for two decades in the hip hop galaxy and well beyond. Influenced by the various 90’s graffiti art expressed in Europe and New York, 123KLAN crafted an hybrid style that gained them swift recognition. They defined around this time a new language that transcended all the graffiti “schools”. their first works were enriched by huge, sharped-angled letters in acid colors and characters with futuristic manga features pose alongside experimental type. Members of 123klan invade the web in 2001 like vandals as a new surface to be painted, They mix graffiti art and graphic design , using this platform as a real tool for creation, expression and dissemination. If the graffiti school instilled in them technical rigour and an acute feel for construction, computer technology opened up new realms of expression. By shifting the boundaries of their two favorite disciplines,123KLAN have advanced the graffiti aesthetics and infused a healthy dose of new ideas into current graphic design. Far from confining themselves to urban walls with the aerosol, the vector allows them to land on multiple medias, everything goes; record sleeve, posters, stickers, toy design, posters, skateboards, canvas, shoes, T-shirts. 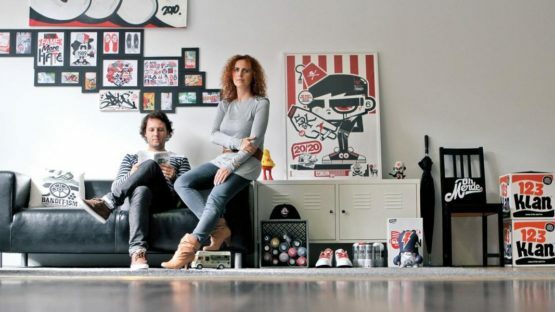 It was after working for the leading brands of streetwear, that Scien and Klor created their own brand in 2007. BANDIT1SM true laboratory initially, the development of the latter allows them to obtain financial freedom, giving free rein to their creatvity. If there was a qualifier to 123KLAN style, it would probably be “hectic” because their work is anything but static, and displays an almost violent vibrancy: each piece is a jewel fashioned with extremely taut lines, in which the flat blocks of colors are sharp as razor blades. Hectic, work is also in its state of perpetual renewal: the many exhibitions and conferences dedicated to their art are all platforms where the duo demonstrates his creative vivacity. Among others, they exhibited in: Brussels, Berlin, Honolulu, Lisbon, Los Angeles, Marrakech, Mexico City, Moscow, New York, Paris, Rio, Sao Paulo, San Francisco, Sydney, Singapore, Tokyo and Zurich. The 123KLAN also show a mind-boggling flair recycle the gimmicks of an ever-changing pop culture that they interpret on their own way, sprinkled with hip hop Reference, sarcasm, or self-deprecating. Indeed, Scien likes to compare his work to that of a DJ mixing a multitude of samples to cut a track. As bona fide contemporary Pop artists, Scien and Klor are following in the steps of Arman, Villeglé and other Lichtenstein: one the one hand, their systematic accumulation of current graphic signs, lettering or logostype calls to mind reminiscent of the aesthetics agenda of pop art artists, on the other hand their loans to Japanese cartoons, north American ‘s mascots, undeniably evoke the exaltation of a mass culture which they soak up and echo with complicitous nods. Industrial or semi-industrial reproduction of their work whether on posters, or through their clothing brand BANDIT1$M on t-shirt, underscore their kinship with one of the most important artistic movements of the twentieth century.